Magento 2 and Magento 1 are quite different systems. Despite both have a lot of common features, there are some core differences between them as well. For instance, there are some unique opportunities related to Magento 2 product import/export. 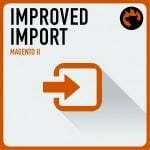 We’ve already written about import / export in Magento 1, so you can easily compare the old procedure with the new one. As for product import / export in Magento 2, it is fully described below. The Magento 2 platform offers an improved import/export system out of the box. Thus, with Magento 2, you get such vital features as product custom options and images from remote URLs without any need to install third-party extensions. The default Magento 2 import works with CSV file types. 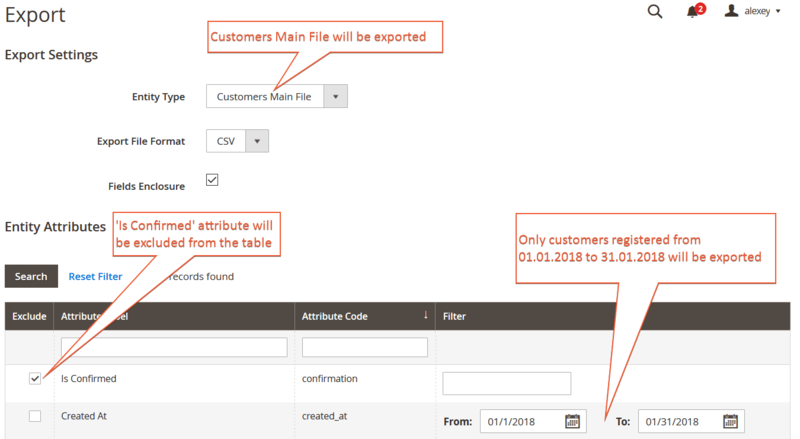 When exporting entities such as products or customers from Magento 2 you will be getting CSV files. Google Sheets are free and you only need a Google account to access it. Uploading a CSV file to Google Sheets doesn’t break the CSV file fomatting. When you have edited a file in Google Sheets you can download it without any changes to the separator and delimiter values. The file is ready for import right after it has been downloaded. Why not use Microsoft Excel or Open Office? Such software tend to break CSV file formatting and automatically change separators and delimiters. If you are an average user you will have hard times editing these settings. Stick to Google Sheets, it is fast and easy. 2. Then, it is necessary to select “Products” on the “Entity” dropdown. 3. Now, you can set up filters as well as exclude unnecessary. 5. Get your formatted csv files with Magento 2 products. Сheck this complete CSV sample with all fields optimized for importing products into Magento 2: Magento 2 csv sample data. The file includes all products from Magento 2 official sample data. To download images for the CSV, follow this link: sample data.zip. Keep in mind that it should be unzipped, and images should be uploaded to your Magento 2 root folder /pub/media/import. 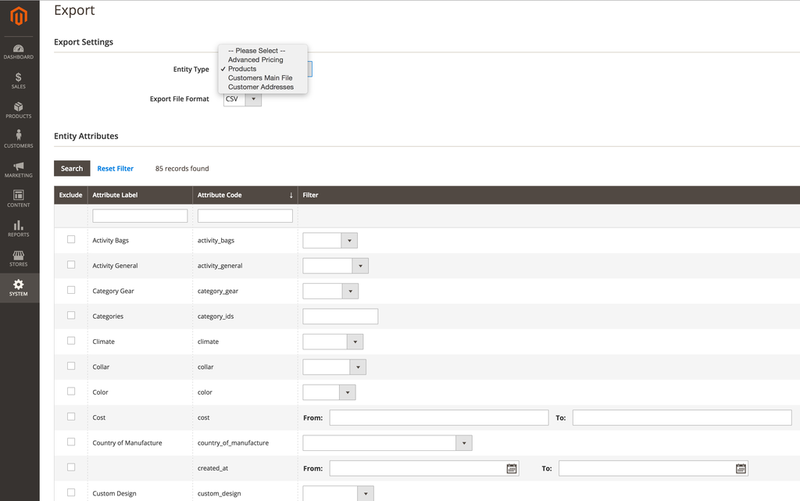 Additionally, you can find the official Magento 2 CSV sample in a dropdown related to import. Go to “System -> Import”. 3. Select an import behavior option: Add/Update, Replace, or Delete. 4. Select your CSV file. 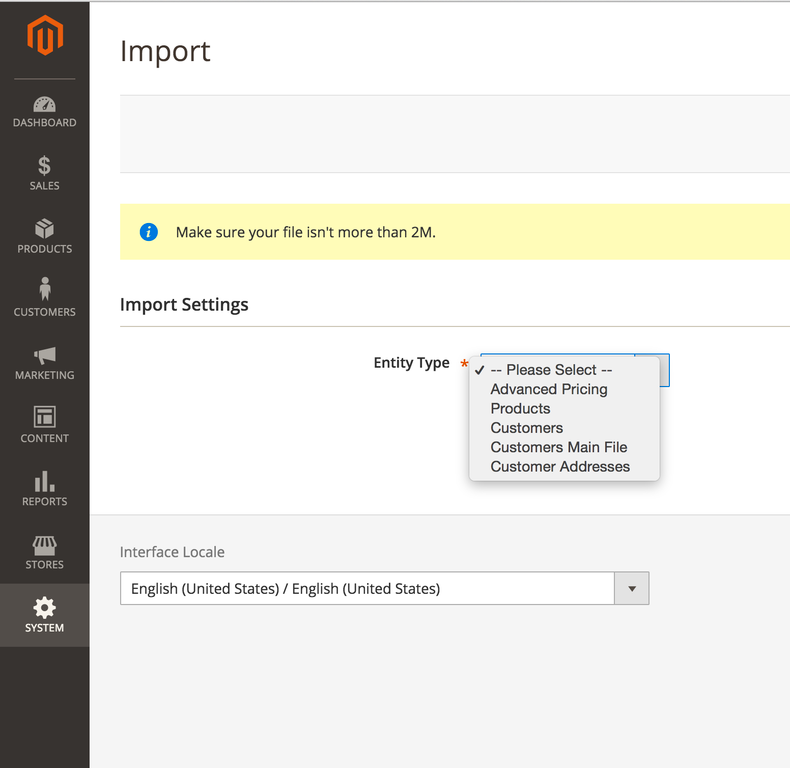 Use the “Select File to Import” option and then click “Check Data” – if data is correct, start importing products to Magento 2! sku – a unique product identifier used as a key product attribute in the Magento 2 core. It is required for all products and should be unique for each of them. sku can include both digits and letters without spaces separated with underscores (_) and dashes (-). categories – product categories in Magento 2 differs from ones utilized in Magento 1, where comma separated category ids are used. In Magento 2, full names of assigned categories, including full path, are required. Besides, assigned categories should be separated by |. For instance, “Default Category/Gear|Default Category/Gear/Bags” means that product should be assigned to both Gear and Bags categories. The latest one is a subcategory of Gear. product_websites – an associated product website code. Use lowercase letters only (e.g. “base”). description – a product description. short_description – a short description of a product. Both, description and short description, could include valid HTML tags. product_online – enables or disables products. Use 1 or 0 respectively. tax_class_name – a product tax class. Allows using capital later and spaces, like in Magento 2 backend (e.g. “Taxable Goods”). visibility – a visibility of a product (e.g. “Catalog, Search”, “Not Visible Individually” etc.). price – a price of a product (e.g. 34.000). special_price – a special price of a product (e.g. 34.000). special_price_from_date – time when Magento starts using a special price instead of a default one (e.g. ‘2015-09-01 15:26:29’). special_price_to_date – time when MAgento stops using a special price (e.g. ‘2015-09-01 15:26:29’). meta_title – a meta title of a product. base_image_label – a label of a base product image. 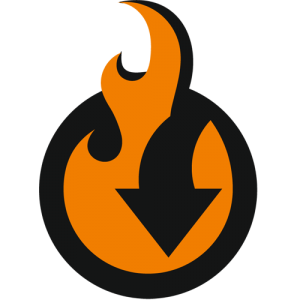 small_image_label – a label of a small product image. thumbnail_image – a name and a path related to a thumbnail product image. Should be uploaded to /pub/media/import as well. The path of /sample_data/m/b/mb01-blue-0.jpg has the following structure: /pub/media/import/sample_data/m/b/mb01-blue-0.jpg. In addition, you can use a direct URL of an image, such as http://site.com/images/some_image.jpg. created_at – time when a product was created. Use the following format: yyyy-mm-dd hh-mm-ss (e.g. 2015-09-01 22:26:27). If the field is empty, date and time of data base record are used. updated_at – time when a product was updated in. Use the following format: yyyy-mm-dd hh-mm-ss (e.g. 2015-09-01 22:26:27). If the field is empty, date and time of data base record are used. new_from_date – sets a product as “new” from the specified date. Use the following format: yyyy-mm-dd hh-mm-ss (e.g. 2015-09-01 22:26:27). new_to_date – stops displaying a product as “new” from the specified date. Use the following format: yyyy-mm-dd hh-mm-ss (e.g. 2015-09-01 22:26:27). display_product_options_in – it is a new feature introduced in Magento 2 which specifies a place on a product page where a block with options should be displayed (e.g. “Block after Info Column”). additional_attributes – import of product custom options and data related to a simple product associated to a configurable product. A sample value for a simple product associated to configurable product: “color=Red,has_options=0,required_options=0,size_pants=32” (Color attribute is “Red,” simple product has options in Magento 2: has_options = 0 – no required options, size pants attribute value is 32). A sample value for a configurable product in Magento 2 – “has_options=1,required_options=1” (Product has required options, simple product SKU is associated in the _associated_sku column ). qty – a quantity of a particular product in stock. use_config_backorders – use a default system value for back-order options (enable / disable). additional_images – additional product images (product media gallery) separated with commas. Images should be uploaded to /pub/media/import. The path of /sample_data/m/b/mb01-blue-0.jpg has the following structure: /pub/media/import/sample_data/m/b/mb01-blue-0.jpg. In addition, you can use a direct URL of an image, such as http://site.com/images/some_image.jpg. additional_image_labels – Сomma separated labels for additional product images from the previous column. If you need to import tier prices to Magento 2, go to System -> Import -> Import Settings -> Advanced Pricing. Here, you should select “Advanced Pricing” from a dropdown list. Next, select “Add/Update” in “Import behaviour”. As for a CSV file, you should remove ALL Groups Column, if there is such. Now, you should easily import Magento 2 tier prices to your website. This procedure allows to save hours of time necessary for manual configuration in the backend. Alternatively, you can export a CSV, edit the file, and reimport it back. This also helps to save time necessary for applying changes to tier prices. Unfortunately, Magento 2 configurable products import is quite a complicated procedure. You can easily improve it with the help of third-party extensions, but below we describe how to achieve the goal with the native functionality of Magento 2. The procedure is divided into several steps, so let’s start with prerequisites. Go to Stores -> Attributes -> Products. Here, you should create and define product attributes. Next, it is necessary to create attribute sets for product attributes you want to import. Perhaps, these sets already exist, but you should check them under Stores -> Attributes -> Attribute Set in any case. If sets are not available, create them. And don’t forget to set up categories properly. It means that categories you are going to import configurable products to should be created before import. You can manage them under Products -> Categories. And may be the most important and unobvious thing: neither simple, nor configurable products should exist in your Magento 2 catalog before import. These are mandatory rules, and we can’t find a way around (until you start using third-party modules). Now, let’s tell a few words about CSV file requirements. It is not a secret that Magento 2 import/export is based on CSV files, but if the requirements are not satisfied, you will never perform Magento 2 configurable products import. Therefore, be less dismissive to the following requirements. Use comma as the field and multiple value separator. This parameter can be changed during the import, but it often leads to failures, so we recommend to cope with this requirement. In a CSV file, list simple products before the configurable product. Otherwise, you will never import your the desired items to your website. Pay closer attention to the “attribute_set_code” field. It is very important for the whole procedure, because of vital data. The field should match the Attribute Set that contains the attributes for each product. Another important field is “configurable_variations”. Here, a pipe separated set of sku/option combinations for each simple should be created. Also note that it should be populated for the configurable product only. The last requirement is true to the “configurable_variation_labels” field – it should be populated only for the configurable product. And don’t forget that it’s role is to correlate the Attribute code to the Label Name. And in the “additional_attributes” field, list options for each simple product. Separate multiple attributes with comma. configurable_variation_labels: for the configurable shirt product – color=Color. As you can see, Magento 2 configurable product import is extremely complicated. The procedure has lots of requirements, but you can easily improve it with the help of reliable Magento 2 import/export extensions. As a Magento administrator, you can configure Magento 2 custom options manually, but there is one serious problem: the process is time-consuming. Therefore, it is a good idea to apply custom options in bulk. It means that you should run Magento 2 custom options import. You must admin that it is not the easiest procedure, but, as you might have already guessed, you daily import routine can be simplified with a Magento 2 import extension. A CSV file with such parameters will apply a quantity of 100 items to the product with SKU 667. Beside, it will set “Stock Availability” to “In Stock” if previously the qty parameter was 0 and “Stock Availability” was “Out of Stock”. The “Product type” (product_type) column is required by Magento 2 and should contain a product type in lowercase – simple, configurable, downloadable, etc. Qty column can be replaced by any product attribute code and this attribute will be updated! Magento 2 allows importing and exporting Customers Main File and Customers Addresses. And with Magento Commerce/Cloud (former Magento 2 Enterprise) you can also import/export customer finance, containing reward points and store credit updates. Customers Main File contains all the personal information of the customer like: name, date of birth, name prefix and suffix. Customers Addresses contains all information about shipping and billing details of customers like: address, VAT, postcode. Customers Finance contains information on customers’ reward point and credit balance and allows updating these values. 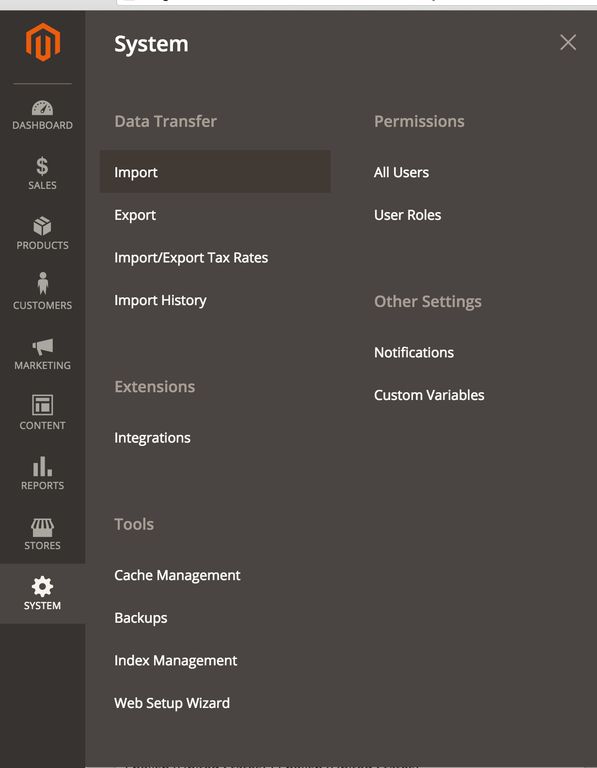 To export customers data navigate to System > Export. At the export screen select either Customers Main File or Customers Addresses, tick out attributes you won’t need and apply filters. Once you are done with filters and excluding attributes scroll down and click ‘Continue’ button. The customer list will be exported and you will be prompted to save the CSV table. Native Magento 2 customer import process allows importing customers and addresses in the same file. To import customer data navigate to System > Import. Here you will be suggested to select the import entity and decide on the import behavior. The process is similar to the product import, so should you already be familiar with it. Once you are done adjusting the import process behavior click ‘Check Data’ button in the upper right corner of the screen. You should get a message similar to this one. If everything is correct and the import table doesn’t require any adjustments click ‘Import’ button to proceed. The import process will end in an import success message. 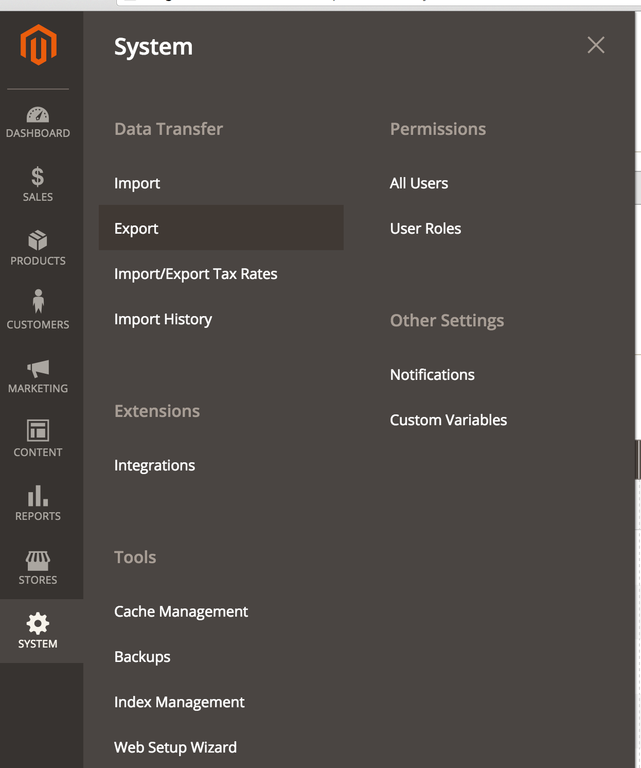 If you want to improve the existing Magento 2 import / export functionality, pay attention to our Improved Import / Export extension, which provides the ability to import your csv files with products data and product images to Magento 2 from a Google Sheet, remote FTP/SFTP server, Dropbox or a direct URL of a source CSV and other files as well as offers a dedicated categories, order and attribute import from CSV, XML, XLS/XLSX, ODS, Json files on the fly import of product attribute values, cron jobs import, and more! Magento 2 event system for the export jobs: on order placed or saved and product in catalog save. As you can see, Magento 2 provides much better import/export capabilities than 1.x but it can still be improved with the help of third-party modules. And the Magento ecosystem offers tons of reliable solutions, so you are free to choose one that suits your particular ecommerce needs. Composing XSLT transformation templates for your file types. You can vote for the features coming in the next Improved Import and Export extension releases. Simply follow the link to the extension roadmap and upvote the features of interest.